Researchers from the University of Saskatchewan and the Geological Survey of Canada (GSC) have discovered a massive meteor impact from millions of years ago in Canada's western Arctic. 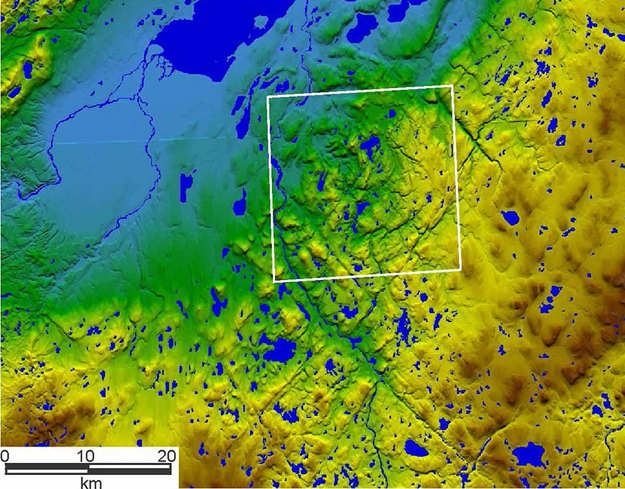 Located on the northwestern part of Victoria Island, the impact crater, or astrobleme, is about 25 km wide and is Canada's 30th known meteorite impact feature. "It's another piece of the cosmic Earth puzzle," explained U of S geology professor Brian Pratt, who made the discovery with GSC colleague Keith Dewing. "Impact craters like this give us clues into how the Earth's crust is recycled and the speed of erosion, and may be implicated in episodes of widespread extinction of animals in the geological past." "Several geologists visited that area in the '60s and '70s," said Pratt. "It was those old industry reports of steeply tilted strata, unusual in the western Arctic, that had us intrigued. Unless you recognized the telltale clues, you wouldn't know what you were looking at. You might see a bunch of broken rocks and wonder how they got there, but we found abundant shatter cones. These are radiating crack surfaces up to a metre in size that are formed from the enormous amount of energy created when a meteorite slams into the Earth's crust. Our map showed that the feature is circular which is characteristic of impact craters. It's an exciting discovery."